Crowe spent a number of months at the end of 1888 and the beginning of 1889 in Scotland. The figures in ‘Military Honours’ were drawn from life from a number of soldiers of the Highland Regiment who sat for him in Aberdeen in the first weeks of 1889. 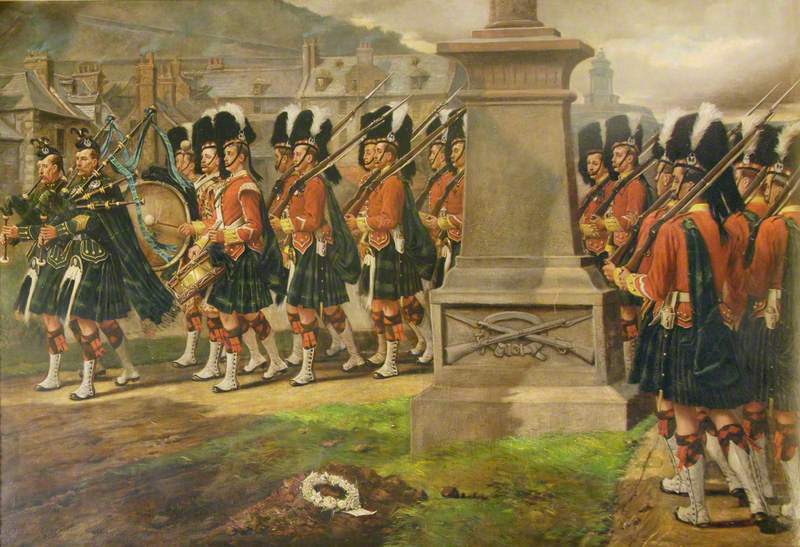 The painting was presented to the Regiment by Lady Dixon-Hartland in 1987. Soldiers funeral kilted Regiment. Shocking bad calves the soldiers show – an Insult to Scotland. Eyre Crowe was a Victorian painter of historical and genre works of art, who exhibited at the Royal Academy from 1846 to 1908. This site, which is a non-commercial appreciation of Crowe's life and work, contains biographical information, details of all his known paintings, auction records, images where available, details of exhibitions, contemporary reviews, and a full bibliography including links to other websites useful to those interested in 19th-century art.